Fried Grouper with Sweet and Sour Sauce ~ I Can Do That! Its was a pleasant surprise when I saw small-ish whole grouper at the grocery store. Grouper is usually sold already filleted from ginormous fish. I got the smallest one, although still very large at almost 3 pounds, and over a foot long. While at the store I was already imagining it deep fried on a bed of red and green peppers with sweet and sour sauce just like the ones in Hong Kong restaurants. I couldn't decide if I should prepare it Chinese-style or Filipino escabeche. They are very similar, the cooking method and ingredients except for soy sauce are almost identical. I guess the Filipino escabeche is another fusion of Chinese and Spanish recipes and became a Filipino dish just like arroz caldo. 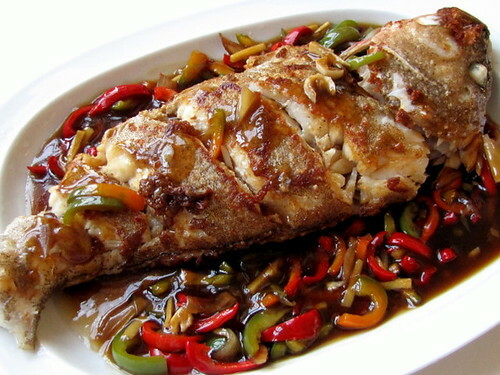 I chose to prepare the whole grouper Chinese-style because I haven't had this dish in a long long time. I realized I didn't have a pan big enough to accomodate the big fish; I used my wok which was large enough but I had to tilt the pan several times to fry the tail which didn't become crispy. No problem, the rest of the fish was crispy, perhaps not as crisp as the restaurant's but it's good enough for me. And besides the dish is sooo yummy. 2 tablespoons cornstarch mixed with ¼ cup water. Cut the garlic, shallots, ginger, and bell peppers into matchstick size pieces. Heat 6 cups oil in a large pan or wok on medium high. Pat dry the fish inside and out and make 3 slits across on both sides. Season inside and out with 1 teaspoon salt and half a teaspoon of white pepper. Dredge in flour, if desired; remove excess flour. Deep fry until skin is crisp. While fish is frying prepare the sauce. In a medium saucepan, heat the oil and saute the garlic, shallots, and ginger for 2 minutes. Add the rest of the ingredients except the cornstarch mixture. Simmer for 2 minutes, taste and adjust seasoning, then add the cornstarch mixture. Simmer until sauce is clear and has slightly thickened. Transfer on a serving platter and place the cooked fish on top of the sauce. Serve immediately with steamed or Chinese-style fried rice. That looks good... yummy, yummy ! this looks similar to a thai recipe with taramind sauce. i love crispy fish with a sauce like this. Sidney and Juliana, whole fish is much yummier. I love eating the head too. Kayni, I once made the Thai-style tamarind sauce once and served it with fried whole tilapia. It was very yummy.